Type "Camp Floyd Rogers" in the "Or pick your own charitable organization" section and press "Search". Press "Select" next to "Floyd Rogers Diabetic Foundation". 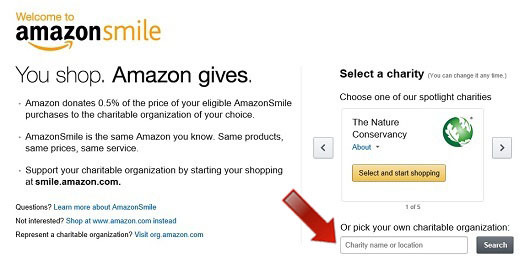 The AmazonSmile Foundation will donate 0.5% of the purchase price from all AmazonSmile purchases. If the purchase is not completed from smile.amazon.com (not www.amazon.com), Camp Floyd Rogers will not receive the AmazonSmile donation. You will know you are in the right place when you see the "Floyd Rogers Diabetic Foundation" under "Supporting".